Two of the most experienced fighters in the stacked 130-pound division will continue the heated Puerto Rico vs. Mexico rivalry when Jason “El Canito” Sosa (20-2-4, 14 KOs) takes on Robinson “Robin Hood” Castellanos (24-13, 14 KOs) in a 10-round super featherweight fight at the Theater at Madison Square Garden on the televised undercard for Kovalev vs. Shabrankskyy. The event takes place Saturday, Nov. 25 and will be televised live on HBO World Championship Boxing beginning at 10:00 p.m. ET/PT. Although the competition between Puerto Rico and Mexico runs deep in the ring, Latinos come together and support each other in times of need. In light of the natural disasters affecting Mexico and the Caribbean, a portion of the proceeds of the ticket sales form this event will be donated to relief efforts for Hurricane Maria in Puerto Rico and the earthquake in Mexico City when ticket buyers use the code LATINOSUNIDOS to purchase their tickets through Ticketmaster. The 29-year-old Sosa, of Camden, NJ and of Puerto Rican descent, is the former WBA World Super Featherweight Champion. He earned his title by handing Javier “El Abejon” Fortuna his first loss as a pro with an 11th-round knockout in Beijing, China in June 2016. 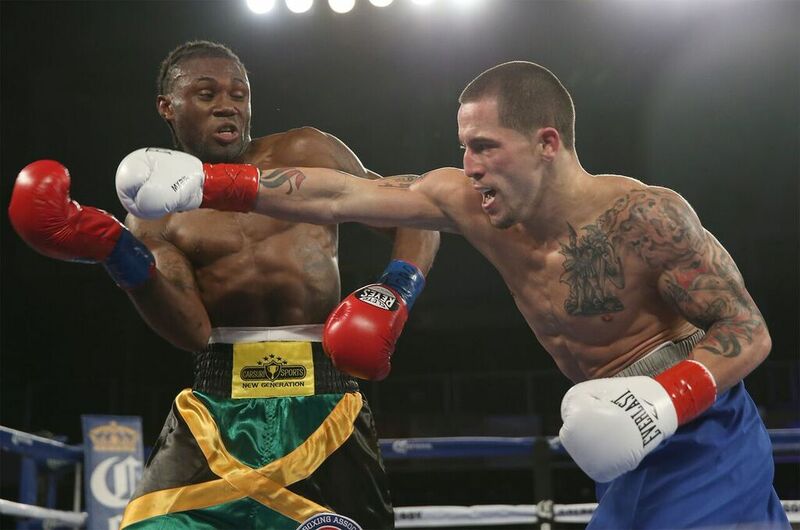 Sosa successfully defended his title with a 12-round decision win over Stephen Smith in Monte Carlo in November 2016 before returning several months later in a tough fight against Vasyl “Hi-Tech” Lomachenko in April 2017. Sosa is also known for fighting to an impressive majority draw against former WBA Super World Featherweight Champion Nicholas “Axe Man” Walters and for stopping former world title challenger Jerry “The Corpus Christi Kid” Belmontes in only one round. Sosa’s aggressive style should produce fireworks against Castellanos. Castellanos is a battle-tested warrior who is coming off a spectacular performance against current WBA Super World Super Featherweight Champion Jezreel “El Invisible” Corrales in July of this year. The 35-year-old native of Guanajuato, Mexico also handed super bantamweight contender and world title challenger Ronny Rios his first career loss, stopping him by TKO in October of 2014. Before challenging for a world title, Castellanos stopped Cuban former unified WBA and IBF Featherweight Champion Yuriorkis “El Ciclon de Guantánamo” Gamboa on the May 5 edition of Golden Boy Boxing on ESPN. After having been so close to winning a world title in his last outing, Castellanos will look to make sure that he gets another crack at the top of the division with a victory on Nov. 25. Tickets are currently on sale and are available at ticketmaster.com and the Madison Square Garden Box Office. Use the code LATINOSUNIDOS when purchasing your tickets to donate a portion of the proceeds to hurricane relief efforts in Puerto Rico and the rebuilding efforts in Mexico following the earthquake in Mexico City. The donations will go to the Hispanic Federation’s Unidos fund and to Habitat for Humanity Mexico. To make a direct donation for hurricane relief, please visit the Hispanic Federation’s website: https://hispanicfederation.org/unidos/. To make a direct donation for earthquake relief in Mexico, please visit the website of Habitat for Humanity and direct your donation to “2017 Mexico Earthquake Response”: https://www.habitat.org/donate/?link=878. Kovalev vs. Shabranskyy is a 10-round light heavyweight fight promoted by Main Events and Krusher Promotions in association with Golden Boy Promotions. Sosa vs. Castellanos is a 10-round super featherweight fight promoted by Peltz Boxing and Golden Boy Promotions. The event will take place at the Theater at Madison Square Garden in New York City, and will be televised live on HBO World Championship Boxing beginning at 10:00 p.m. ET/PT.